When analyzing best practices for cloud architectures and corresponding software design and implementation, we realized that telemetry and logging patterns were completely detached from their analysis activities which were not even mentioned when expected. Some unification is needed there for software construction and software post-construction phases related to software diagnostics solutions. We propose to name the unified discipline Software Diagnostics Engineering which has a solid foundation in Theoretical Software Diagnostics we introduced earlier. This discipline is not limited to the cloud and site engineering but encompasses software technologies vertically (full stack software diagnostics) as well as horizontally (IoT devices, mobile and desktop applications, individual servers, clusters, clouds, and fogs). The difference between other diagnostic engineering disciplines is that in software diagnostics we know software internals and can perform operations not possible in technical and medical diagnostics. 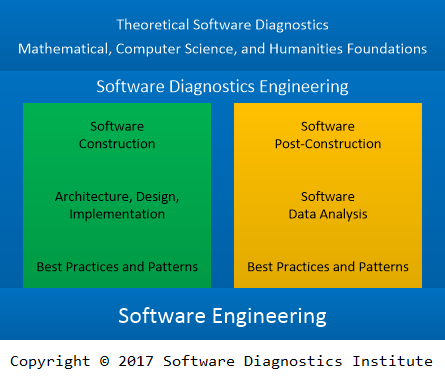 We use the definition of software diagnostics introduced in the latest seminar as a discipline studying signs of software structure and behavior in software execution artifacts (such as memory dumps, software and network traces and logs) using systemic and pattern-oriented analysis methodologies.